"All human beings are born free and equal in dignity and rights. They are endowed with reason and conscience and should act towards one another in a spirit of brotherhood"
Nazareth – Last Tuesday evening, October 24th, the parliament of the European Union voted on the EU-Israel Agreement on Conformity Assessment and Acceptance (ACAA) protocol. Despite an impassioned argument from Belgian Socialist MEP Veronique de Keyser for the ACAA protocol to return to committee stage, the protocol was passed. The ACAA is an addition to the EU-Israel Association Agreement of 1995 and it stipulates that Israeli pharmaceutical products are held to a high enough standard to be sold in the EU. The vote, in addition to reducing trade barriers, also sets a precedent for further trade agreements between the two parties. The vote passed with 379 MEPs in favor, 230 against, and 41 abstentions. Supporters of the assent procedure described their rationale in terms of international trade while detractors saw this as an opportunity to activate the human rights conditionality of the law. In a letter to members of the European Parliament prior to the vote, The HRA, along with international and European human rights organizations, advised that human rights conditionality should be activated in the case of the ACAA protocol. In terms of setting precedent, this vote not only alleviates trade restrictions, it also signals that the European Union is neglecting its responsibility towards international human rights. Though the outcome of this vote is a disappointment, our future efforts will not be stymied. The HRA will continue to advocate in the EU on behalf of the human rights issues facing the Palestinian Arab minority in Israel. Levy reports that the poll was ordered by the Yisrael Goldblum Fund, a frequent collaborator with the New Israel Fund (NIF); however, the NIF has publicly denied participation. Despite the controversy surrounding the poll’s provenance, the results are simultaneously striking and frightening. I would like to present some of the findings of the poll to you here. It is my fervent and sincere belief that the numbers that follow are trustworthy and that they quantify, in many cases for the first time, the bleak reality facing the Arab Palestinian minority in Israel. The poll was conducted between September 9th and 12th of this year. 503 Jewish Israelis participated. Though the term in question was not specifically defined on the survey itself, 58% of responders accepted the description of current affairs in Israel as “Apartheid”. 33% of Jewish Israelis polled were in favor of legally denying Arabs the right to vote, if the West Bank were to be annexed. 49% want the government to take more care of its Jewish citizens than its Arab citizens. 42% do not want Arab families as neighbors. 42% do not want Arab children in classrooms with their own. 47% support a population transfer of Arabs to the Palestinian Authority. Only 38% of responders believe that, in no respects, is there Apartheid in Israel today. Though there was racism against the Arab Palestinian minority from all sectors polled, the ultra Orthodox held the most severe opinions. 70% of self-identified ultra Orthodox favor barring Arabs from voting in the case of an annexation of the West Bank, 82% would support discrimination against Arabs in hiring for government jobs, and 79% will not accept Arab neighbors. These figures have provoked a massive response from partisans on all sides of the issue from all over the world. I think that the additional attention to the issue is a positive development, but I encourage readers to see past the polarizing “Apartheid” label to the reality these numbers describe. There is a clear divide in Israeli society and the majority of Israelis clearly see no benefit in bridging it for the sake of the achievement of equal, democratic rights for every citizen. Additionally, I think that this poll illustrates the increasing challenge the HRA faces in its work raising awareness of Palestinian issues in Israel as well as the importance of the work we do in educating the Palestinian youth on human rights values and ways to struggle against the discriminatory practices in a positive manner. Nazareth- The Arab Association for Human Rights (HRA) calls on the Members of the European Parliament NOT to give their vote to an important trade agreement with Israel,sending a clear message to Israel that the Arab Palestinian minority in Israel won’t stand for ‘business as usual’ given the deterioration of the situation on the ground. The European Parliament’s plenary session is due to vote on the EU-Israel ACAA protocol on 23 October 2012. At this occasion, the HRA urges MEPs to suspend their vote on the ACAA protocol so as not to create a legal precedent that could further jeopardise a just and lasting peace in the Middle East. These concerns have been echoed in the outcome of the vote in the international trade committee of the European Parliament on September 18th, which gave a consent vote to ACAA with a surprisingly tight margin for a technical agreement (15 in favour, 13 against and two abstentions) and could now be overturned in the Plenary session of the European Parliament. ACAA, or the Protocol on Conformity Assessment and Acceptance of Industrial Products, is a protocol attached to the EU-Israel Association Agreement. In practice, this agreement allows industrial products to enter the respective markets of the parties without additional testing and conformity assessment procedures. In practice, this means that both European and Israeli consumers will have quicker access to more and cheaper pharmaceuticals goods. Regardless of potential benefits, this vote represents an opportunity to show thatIsrael’s human rights violations will not stand. The agreement does not account for the fact that the Israeli pharmaceutical industry is deeply involved in the occupation, with devastating consequences for Palestinians in need of basic healthcare. HRA General Director, Mohammad Zeidan, sent a letter to Members of the European Parliament asking them to withhold their consent to this agreement until there is tangible progress in Israel’s respect for international humanitarian law (IHL) and international human rights law (IHRL). ACAA is not just a technical agreement – it has implications for the Parliament’s credibility in ensuring that the EU upholds human rights in its foreign policy, in the Middle East region in particular. At present, there is only one annex to the ACAA protocol, which covers pharmaceutical products,; however, in the future other annexes could be added like cosmetics and toys. Negotiation on the ACAA Protocol between the EU and Israel started in early 2009. The ACAA Protocol was signed in May 2010 and has since been waiting for the assent vote of the European Parliament. The final vote on October 24 maybe be remembered as a watershed moment in the advancement of EU/Israel relations, lets not let the EU’s human rights obligations be forgotten. The HRA letter to the MEPs was a part of a larger campaign organized by the Euromed Human Rights Network, which is a coalition of human rights organization based in Europe and the Middle East. This article originally appeared at +972 Magazine on 8/29/2012. You can see it at its original domain here. What is the connection between Israel’s labor union, Jesus’ childhood home and Ol’ Blue Eyes? When Christian tourists come through Nazareth on the half day their guidebooks recommend, they take the suggested walk around the old city, see the Basilica of the Annunciation, stop for ice cream, maybe even visit the Souq. What they do not see is any mention of their favorite crooner from the 1960s – Frank Sinatra does not regularly come up in conversation. This may not be surprising to them, but it would be to him. 1962 was a very good year for Frank Sinatra. He gave concerts in Hong Kong, Japan, Italy, France, Greece, England and one other country that had always held a special place in his heart: Israel. The World Tour for Children, which he funded personally, ended up raising over $1 million for children’s charitable causes worldwide. Over $50,000 of that money found its way to Nazareth, and it was only the beginning. Sinatra’s love for Israel was lifelong; He was known for wearing a miniature mezuzah around his neck in memory of a childhood neighbor. And since Sinatra was a practicing Roman Catholic, his tour of the holy land included many significant Christian sites. He came to Nazareth for a week to see holy Christian sites like Mary’s Well and Joseph’s Workshop on his way to the Sea of Galilee, but he was struck by the people he met living in Nazareth. Here, Sinatra saw an opportunity where his considerable wealth could make a difference. 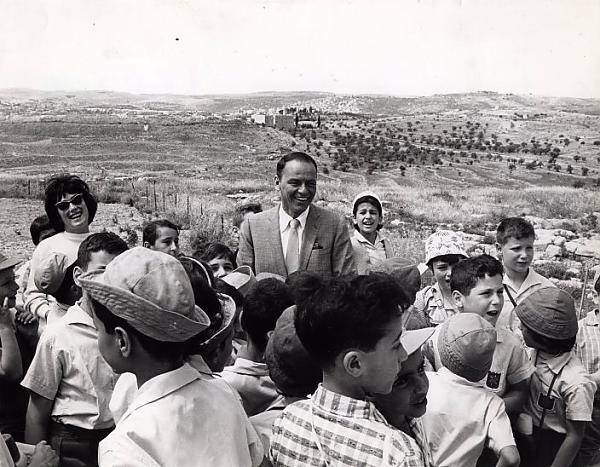 In the tour documentary, he specifically mentions his support for the “Israel Histadrut Campaign” which, according to Sinatra, “opens the gates of opportunity for thousand of boys and girls.” He bought a parcel of land near Mary’s Well and tasked the Histadrut (the national Israeli labor union) with building the Frank Sinatra Brotherhood and Friendship Center for Arab and Israeli Children; presumably it would serve to open the gates of opportunity. He donated the profits from his concerts in Israel to build the center and to encourage inter-cultural exchange between the Palestinian Arabs and the Israeli Jews. Unfortunately, all Sinatra donated was money. He did not help develop or organize any specific organization to bring his vision of cultural exchange into reality. After presiding over the groundbreaking ceremonies of the Center, he moved on from Nazareth. From that point the property fell, in operational capacity, to the Histadrut. Sinatra returned to Nazareth in 1965, he was shooting a film in Israel with Yul Brenner, to dedicate the Center and donate a further $100,000, the total fee for his appearance. In the 1960s the Histadrut was a politically controversial organization, only admitting Arabs as members in 1959. Additionally, Arabs who joined were seen as opportunists because they were living under military rule. In 1962, George Sa’ad was the Nazarene leader of the local Histadrut branch, which meant managing Sinatra’s $150,000 donation. Sa’ad used the money to establish a non-profit organization intended to organize youth groups and solicit donations to sustain the center. Yet despite his best efforts, there is no clear evidence of any inter-ethnic, inter-faith, or inter-cultural youth groups meeting at the Sinatra Center. 1967 saw another $100,000 donation from Sinatra to the Histadrut. His announcement of a further contribution to the Sinatra Center in Nazareth was the climax of a formal four-day conference in Miami Beach, Florida. Ten years after Sinatra’s first trip, the local chapter of the Histadrut began using the Sinatra Center as office space. When I was there, a representative from the Histadrut offices in the Sinatra Center couldn’t provide any records of George Sa’ad’s efforts to host youth group meetings or to establish community outreach groups in the Sinatra Center. Even Suhail Diab, spokesman for the Nazareth Municipality, could not explain what happened to Sinatra’s original donation; it was exclusively a Histadrut-managed affair and no official government records remain. In 2000, one woman, Safa Dabour, unwittingly began bringing Frank Sinatra’s vision back to Nazareth. She did not know about Frank Sinatra and his donation; he was just a name on a building with a great location. She founded El Sana, an association with a mandate to “find exciting ways to celebrate diversity and build a better, peaceful society.” Supplying all her own start-up costs, she purchased development rights to one wing of the Frank Sinatra Brotherhood and Friendship Center for Arab and Israeli Children. She funded the construction of Cinematheque, the only Arab-owned performing arts facility of its kind in Israel. It is a fully functioning movie theater and stage with an accompanying restaurant and bar. Safa and her son have been trying to find out what happened to the original donation, but to no avail. She began soliciting the Sinatra Foundation as well as the Histadrut office which still occupies part of the Sinatra Center, but has no information regarding the center’s history. In 2006 she sent a letter asking for information regarding the original donation in 1962 and about the possibility of a new donation in Sinatra’s name to El Sana. She has sent three letters since and has yet to get a reply. Frank Sinatra probably ought to have demanded more for his money in the first place. In the meantime, El Sana is actively looking for volunteers to help out with a family festival planned for September. “هي” من قرية في النقب، من عائلة بدوية أصلية في المنطقة شردتها النكبة عام 1948 وقطعت تواصلها. قسم كبير من العائلة استقر بعد تشريده في بلدات الضفة الغربية. احتلال حزيران 1967 أعاد التواصل للعائلة فتعرف عليها أحد أقاربها من بلدة في الضفة. تزوجا وسكنا حيث تقطن الزوجة في النقب وأنجبا أطفالاً. استفاقت “هي” ذات يوم لتجد زوجها مبعداً للضفة، وممنوعاً ليس فقط من حق الإقامة المؤقتة، وإنما حتى من حق الزيارة عندما يريد. رفضت “هي” أن أنشر أسمها الحقيقي ولا اسم زوجها، وطلبت أن أبدل بعض المعلومات عن عائلتها حتى لا يتم التعرف عليها. “يكفينا ما نحن فيه من ملاحقات وتهديدات وحتى من ضغوطات لتجنيدي أنا المواطنة العربية في إسرائيل، أو زوجي المواطن الفلسطيني في الضفة، للعمل مع المخابرات الإسرائيلية ضد شعبنا مقابل وعود ببعض التسهيلات لنا”- قالت. لنعطِ العائلة أسماء رمزية ذات مغزى يعكس حالتها، لنسمِّ الأم “فلسطين“، ولنقل إن عمرها 35 عاماً وأنها أم لأربعة أبناء. ولنسمّ الأب “عربي” ولنقل إن عمره 40 عاماً، وأن أعمار الأبناء تتراوح بين السنتين والإثني عشر عاماً، وأسماء البنتين: “باقية” و”حنين”، والابنين “صامد” و”نضال”. الأب “عربي” غريب ومطرود من أرض العرب ومسقط رأس عائلته – النقب. الأم “فلسطين” تشتاق إلى أهلها العرب وتعتقد أنه من الطبيعي أن تتزوج عربياّ ومن أقاربها وعشيرتها. وتتساءل “بأي حق يعتبر القانون الحق الطبيعي جرماً يستحق العقاب”. الابنة “باقية”، الطالبة الممتازة في صفها المدرسي تصّر على البقاء في قريتها ومدرستها وعلى حلم انتظار عودة الأب ولو لمرة واحدة، لحضور حفل تسلمها شهادة الامتياز التعليمي، حين تترفع من صف مدرسى الى آخر. أما “حنين” فلا تكف عن الحنين للوالد وتداهمها الأحلام والكوابيس أثناء النوم لدرجة إثارة الشكوك حول إصابتها بمرض نفسي يلازمها. الابن “صامد” ما زال صامداً في محاولة تمثيله لدور رب العائلة، رغم كونه طالباً في المرحلة الدراسية الابتدائية ورغم أن مرض القلب يهدد حياته. والابن “نضال” متأكد أنه سيكبر قريباً ويصبح مناضلاً وقادراً على الكفاح لإعادة وحدة عائلته، رغم أن الذبحة الصدرية وضيق النفس يكادان يقتلانه. من حق الأم أن تعتقد أن وضع العائلة السكني والاقتصادي الاجتماعي الفقير والنفسي الخانق والتوتيري… هو الأساس والسبب لمرض الأطفال. “بيتهم” عبارة عن براكية صغيرة من الصفيح والخشب لا تصل مساحتها الى 20 م²، وتأوي خمسة أنفار دون أن تقيهم من حر الصيف ولا برد ومطر الشتاء. الأم هي رب العائلة… “أنا الأم والأب والمعيل الذي عليه أن يعيل عائلة من دخل بخس من مخصصات التأمين الوطني التي أقبضها”. هي تتذكر بحرقة سنوات خلت حين كان زوجها يعيش معها في القرية ويعمل في البلاد ويسكنان في بيت أفضل. كان ذلك قبل صدور ذاك التعديل الملعون لقانون المواطنة. تقول “فلسطين”: “أصبح زوجي، بعد صدور القانون، من “دولة معادية” وفي “حرب مع إسرائيل” مع أن أصله من النقب ومن أقاربي وقبيلتي. ورغم أنه لا يجيد حتى استعمال بارودة صيد بدائية للطيور وللحيوانات البرية. ولا توجد في سجلّه أية مخالفة أمنية حتى في السنوات التي عاشها معي في النقب داخل إسرائيل”. “فلسطين” والأولاد في تواصل هاتفي مع الأب – “عربي”، ويزورونه أحياناً. إذ أن زيارة “المواطن الإسرائيلي” للضفة الغربية ليست ممنوعة ولا تحتاج الى تصريح مثل الزيارة لغزة. لكن كل زيارة تكلفهم مقابل السفريات في سيارة مستأجرة (لا يوجد بين بلدتيهما خط مواصلات عامة) ما يقارب ال200 دولار. ويكون على الأم أن تقرر كل بضعة أشهر هل تحرم بيتها وأولادها من بعض الطعام والثياب حتى ترى الزوج ويرى الأبناء أباهم، أو تتنازل عن السفر واللقاء. كلا القرارين صعب ويُثقلان على ضميرها. تقول الأم- “فلسطين”: “تحسدني إحدى صديقاتي في القرية لأن زوجها مبعد إلى غزة ويكاد يتعذر عليها وعلى أبنائها تحصيل تصريح لزيارته. لكني أصارحك بأني أنا التي أحسدها، لأنها غير ملزمة بالاختيار بين إطعام العائلة وبين رؤية الأب. أعفوني من هذا الامتحان”. الأب “عربي” مثله مثل سائر الناس البسطاء العاديين في الضفة… فقير هو الآخر وعاطل عن العمل يتلقط عملاً موسمياً مؤقتاً بين الحين والآخر. لذلك توصّل مع زوجته إلى ابتداع حل لمشكلة الزيارة بأن يزورهم هو، المحروم من دخول إسرائيل، خفية وتسللا. هذا قرار حافل بالمخاطرات … إذ قد يجري ضبطه على الحدود أو في بيت وقرية الأم أثناء الزيارة، ومن ثم اعتقاله والزج به في السجن لشهور، أو لسنوات إذا ما جرى تلفيق تهمة أمنية له، كما تقول “فلسطين”. تعلو فجأة ابتسامة رضا على وجه “فلسطين”، تنظر حولها متفحصة المكان فيما إذا كان أحد يرانا أو يسمعنا. تهمس لي: “لكنه يزورنا، وأحياناً مرتين في السنة الواحدة”. ابتسامة الرضى على وجهها تتحول إلى ما هي أشبه بابتسامة الانتصار. انتصر “عربي وفلسطين” والأطفال “باقية وحنين وصامد ونضال” على دولة إسرائيل… على القوة العسكرية الرابعة في العالم ومالكة السلاح النووي. لقد هزموها… والتقوا كعائلة، أباً وأماً وأربعة أطفال! “أحلم بزوج وبأب للأطفال، مثل كل الأزواج والآباء… يعيش مع عائلته. هذا أقصى ما أحلم به.”- تقول “فلسطين”. حين يزورهم “عربي” سراً يأتيهم متخفياً ومتلحفاً بسواد الليل حتى لا يراه ويتعرف عليه أحد. يحبس أنفاسه داخل البراكية، ويتحلق الأولاد معاً حوله وعليه- على ظهره وعلى رجليه وعلى صدره. بعد يوم أو يومين يختفي هذا الفرح السجين. ابنٌ يقول لي إنه يحلم بأن يخرج أبوه معه للشوارع وللبلدة القريبة … مثله مثل كل الآباء. وبنت تسأل لماذا لا يأخذها والدها للتسوق في المدينة القريبة… مثلما يفعل آباء زميلاتها. “حتى عندما زارنا في أحد الأعياد لم نستطع السفر كعائلة مع الأولاد لحدائق وأماكن الألعاب والأسواق، كما تفعل كل العائلات. إذ قد يصادفنا شرطي ما ويطلب هوياتنا الشخصية … وعندها سيُعتقل الزوج ويُزّج به في السجن، فلا نراه في زيارة مكلفة منا ولا في زيارة سرية تسللية منه، لذلك عيّدنا “سجناء” في البراكية- تقول “فلسطين” . ليس الأولاد فقط وإنما الأم أيضا تعاني من شتى الأمراض. هي من ناحية العمر، ما زالت فتية. لكنها تعاني من شتى أعراض الأمراض- الضغط والسكري وضيق النفس. نصحتها عجوز من القرية بأن تطلق زوجها وتتزوج من آخر يكون “أباً” للأطفال وسنداً لها ومعيلاً للعائلة. احتدت “فلسطين” لهذه النصيحة، وزعقت: “بأي حق أعاقب زوجاً أحبني ولم يتزوج من امرأة ثانية رغم افتراقنا القسري الطويل؟ ثم أنا لا يمكن أن أجلب “أباً” جديداً للأطفال. ولا يمكن لأي أب “جديد” أن يحب الأطفال كما يحبهم والدهم وكما يحبونه هم أيضا. ينصحني البعض هنا بالطلاق، وينصحه البعض هناك بالزواج من امرأة ثانية. و”ينصحنا” المسؤولون في وزارة الداخلية، الذين يرفضون سنوياً طلبنا بلم الشمل، بأن ننسى حلمنا البسيط والطبيعي بأن تعيش الزوجة مع الزوج ومع أولادهما تحت سقف واحد. لكن لن نُطلّق حلمنا وحلم أطفالنا بأن يعود زوجي- والدهم للعيش معهم. “فلتُطلق” إسرائيل قانونها-” تنهي “فلسطين” كلامها معي. الابن الأصغر “نضال” يلعب بالأتربة مع بعض دجاجات، ليس بعيداً عنا، وينظر إلينا بين الحين والآخر. لا أعرف أن كان يسمعنا أو إن كان يفهم ويعي ما يكون قد سمعه. لكنه يفاجئنا، منادياً صارخاً على أمه : “يما أنا راح ارجّع أبوي”! هل يسمع العالم تصميم الطفل “نضال”؟! أو آهة ورجاء الأم “فلسطين” التي تقول إن أقصى أحلامها هو أن يعيش زوجها معها، أباً لأطفالهما. All this week the Arab Association for Human Rights (HRA) has been publishing the contents of its newest report, “Stripping Citizenship”, in serialized updates here and on our website. These stories were reported and written by Samih Ganadri and edited internally by the HRA. Each story intends to display the human consequences of the discriminatory legislation and to show you reality of an often underrepresented minority. This fifth installment marks the end of our series. To see the first post including relevant background information and the preface to the report, click here. Tayseer Khateeb is a young man from Acre, born in 1973. In 2002, he visited the Jenin refugee camp in the West Bank in order to gather information for his PhD studies about the identity of Palestinian refugees. He had completed his Masters degree in Anthropology at a German university, and had received a scholarship from a Canadian university for his doctoral studies. Officials in Jenin directed him to the Ministry of Health office, where he met the staff member in charge, Lana Khateeb, who was born in 1978. What happened between them was like a magnetic field. “I was drawn to her” says Tayseer; “I was drawn to him” says Lana. Tayseer had planned on returning to the office in Jenin in a week to collect the information that the “staff member” was preparing for him, but he was back the next day. Tayseer said he had returned “not only for the information,” while Lana said, “I was surprised to see him the next day, but I was waiting and expecting it.” I met with each of them separately. His visits continued. Despite the barriers, their love and affection grew deeper, and even while the Jenin camp was, at the time, under a violent military invasion, aimed at striking the resistance to the occupation. They decided to get engaged. At first, Lana’s parents were reluctant to agree to this relationship, because they were concerned for their daughter’s fate. She would have to go to Canada, where Tayseer was continuing his academic studies. Would they return after he graduated? If they did return, who would ensure Lana’s citizenship in Israel? At the time, Amendment No. 1 of the Citizenship Law, which would prevent this, had been issued. “A love that no barriers, military rifles or laws could prevent,” says Tayseer. He adds, “There is no law in the entire world that can prevent and forbid love.” It has been ten years since the amendment was issued, and “Palestinian Arabs, on both sides of the border, are continuing to fall in love and get married” said Lana when we met in March 2012. Lana’s family in Jenin is educated, intellectual and progressive, and Lana graduated from university with a degree in business administration. They got engaged with their parents’ blessing in 2003. Tayseer traveled to Canada on his own, planning to return in six months to get married and take his wife back with him. Then, Tayseer’s mother became severely ill, needing to spend days at a time in the hospital. Because Tayseer’s father had died and he was an only child, he returned to Acre to be with his mother. While Tayseer stopped his PhD studies, his relationship with Lana continued and became even more serious. For months, he spent his time traveling between his ill mother in the hospitals and nursing homes, and crossing checkpoints and traveling on rugged bypass roads to visit his beloved who was besieged in Jenin. How could he marry her and bring her to Acre? Particularly since the occupation only understands the language of the rifle. The law does not understand the language of human communication as it legislates with the language of separation and division. In 2005, Tayseer found the solution to their problem by taking advantage of a loophole in the law, which allows first degree relatives to visit their family in exceptional cases, such as a serious illness. Tayseer’s mother was very sick. Lana was his fiancée, as they had gotten engaged before he had gone to Canada. Thus, Lana and her mother were able to get a permit to visit Tayseer’s mother for two days. Lana came to Acre and through advance planning, the wedding hall was ready, and they had their wedding. Over the next eight months, Tayseer visited his wife in Jenin on a weekly basis. Lana could visit her husband in Acre once a month and only for a day or two, depending on the “mercy” of the security forces, and by proving that Tayseer’s mother is still very ill. A wife visiting her husband in their home is not a humanitarian issue that requires violating the law that prohibits people from a “hostile state” from entering Israel. However, Tayseer is an academic intellectual, and a brave man who does not give up. He took advantage of another loophole in the law, which authorizes the examination of reunification requests (not approval, just consideration) if the wife is older than 25 years old. He enlisted all his abilities and awareness of his rights, as well as the local and international media, and declared a “war” on the Israeli state and its laws. Israel, a superpower, is waging a war on a husband and wife, aimed at preventing them from living together. Israel started this war. “We will not surrender nor give up on our right to fight back, to wage a peaceful, empirical and legal war in order to ensure our family’s well-being. We will see who will win.” says Tayseer. Then he adds, “Israel has even distorted our language and our conception. We talk about a war, about battles, victory and defeat while the entire issue is about a wife’s right to sleep next to her husband, to live in her own home. This is reality, not reason. I doubt whether Eugène Ionesco could have imagined or created such absurdity in his literature of the absurd”. Lana recalls her fleeting visits to Acre to see her husband. She tells me bitter stories of crossing the borders each time, and about one specific incident that happened in Acre. Tayseer’s car had broken down when he needed to bring Lana home on the second day of her visit (in accordance with the duration of the permit). Lana had to stay for an additional day, while Tayseer went to fix the car. While she was at home, she heard a knock at the door; she was not expecting anyone, other than the security forces. Her heart started racing and she began to sweat. She ran into the closet and hid there. She heard the apartment door opening, and footsteps walking throughout the house and coming towards the closet. She felt suffocated; they would now take her to prison and then back to Jenin. She would not see her husband again after today, and all her hopes of getting temporary residence were ending. Her file would now be tainted with a serious “criminal security” violation, which was remaining in her marital home a few more hours than was allowed. She was suffocating and felt she would die; she lost consciousness, and when she woke up, there was no one in the house. Later, she found out that those who had entered her house were Tayseer’s friends who had come to visit. In most cases of marriage between Arabs from the Occupied Territories and Arab citizens of Israel, the husband is usually from the Occupied Territories. However, in this case, Tayseer is the citizen. For that reason they cannot presume that he got married in order to live in Israel, or to carry out sabotage, or any other security violation in Israel. Despite these facts, the Israeli authorities refuse to give his wife Israeli citizenship or even temporary residence. However, Tayseer succeeded in winning his “war” on Israel. In 2006, he secured the right of temporary residence for his wife from the clutches of the Israeli authorities. This temporary residence needs to be renewed annually. Each year, and for three months before the temporary residence expires, the family goes through a painstaking “battle” of reviews and submission of papers. They have to bear the rudeness and intrusion of security personnel into their personal and private affairs, in addition to the disgraceful offers of a relief from state policy in exchange for betraying their family’s national dignity and patriotism. At times it reaches the point where a security officer advises Lana to divorce her husband. These months of grief finally ended with the “victory” for the couple. They won the right to continue to live together, at least temporarily, for another year. That was their situation until today, April 2012. Tayseer returned to his PhD studies at Haifa University. His dissertation was on “Identity”. He now works as a lecturer in the Western Galilee College in Acre, teaching Arab and Jewish students. He also works as a “creative writing” coach in the Jenin Theater. His wife, Lana, lives with him (always temporarily), and they are raising their two children together; their older son, Adnan, who was born in 2007, and their younger daughter, Yusra, who was born in 2008. Tayseer is constantly busy with his work, his studies and his social democratic activities, to the end of securing full citizenship for his wife. As he is the only provider for the family, the expense of dealing with these issues affects their household financial capacities, but he doesn’t complain. What worries and bothers their family is securing citizenship for Lana, his wife and the mother of his children. The issue of citizenship constantly concerns Lana; every year, she is fearful they will refuse to renew her temporary residence. Not only that, she says that, in general, when people read about the problem of family reunification, the first thing they think of is the possibility of banishing the spouse. However, the reality is much more complicated and complex; the lives of the entire family changes, as they are tested financially, socially and psychologically. She and her children are always weighed down by the absence of permanent citizenship, because of this racism and discrimination that reaches the extent of apartheid. Lana, like other spouses, does not have an Israeli ID because she is a temporary resident, which means that she is deprived from the right to work, drive a car, or have social and health insurance. She is “absent”, while “present” in Israel. She is temporary. She is incomplete. She is just someone’s wife. She has no free personal entity that gives her the right to work, be active, productive and a self-fulfilling member in society. This has a social and psychological impact on her, her husband, and their children. Tayseer tells me that the security forces at the Jenin checkpoint always take his wife and her bags to a side room, because she does not have an Israeli ID. He and the children wait for her in the car. His wife is subjected to a humiliating search, and even a more degrading interrogation. She is sometimes gone for a long time, and the children start to cry. How can you explain to them the reason why the police, who are heavily armed with guns, only take their mother? How can you assure them that she will return to them? Tayseer’s family is not originally from Acre, nor is Lana’s family originally from Jenin. Tayseer’s family took “refuge” in Acre; his mother was displaced from Al Manshiyya village, and his father from Mia’ar. Both villages were destroyed by the Jewish forces and their people expelled during the Nakba in 1948. Lana’s father and many of her relatives in Jenin are refugees from the village of Saffuriyya, near Nazareth, which was also destroyed during the Nakba. Israel has built a settlement called “Tzipori” on the remains of the village, in order to hide the evidence of their crime, and to accommodate the new Jewish immigrants from around the world, who enjoy the right of citizenship on the ruins of the Arab village. A refugee in his homeland, whose parents are also both refugees, meets a refugee, a daughter of a refugee family in the Jenin refugee camp. They fall in love, get married, have two children, but still they continue on being refugees. There are still barriers and walls preventing members of one family, one nation, to unite. Tayseer’s and Lana’s only fault is that they were born as Arab Palestinians in their homeland. For relevant background information and the preface to the report, click here. To read the first story in our series “The Father is in the Drawer”, click here. To read the second story in our series “Is there an end to this displacement”, click here. To read the third story in our series “My Wildest Dream”, click here. To read the fourth story in our series “The Hidden… The Present … The Family of the Dead… The Living”, click here. “Stripping Citizenship was reported and written by Samih Ganadri. It was edited and published internally by the Arab Association for Human Rights. If you would like a physical copy of the full report, please send an email to hra1@arabhra.org. أليس لهذا التية والتشريد … من آخر؟! نَكبَت نكبة العام 1948 قرية عاقر قضاء الرملة، كما نَكَبَت أكثر من 478 قرية عربية فلسطينية وخربة وتجمعاً بدوياً. هَدمت قوات الجيش الإسرائيلي القرية وشرّدت أهلها. وصل بعض الأهالي الى غزة واستقروا هناك، واستقر آخرون في بلدات عربية ضمن المنطقة التي قامت عليها إسرائيل. وعلى أنقاض قرية عاقر بنت إسرائيل مستوطنة يهودية هي “كيبوتس عقرون”. يعود أصل آل أبو غزال، الى قرية عاقر. قاد التشريد بعضهم الى غزة، واستقر بعضهم الآخر في مدينة اللد وأصبحوا مواطنين في إسرائيل. نكبة ال-48 شردتهم وقطعت أوصالهم، واحتلال حزيران 1967 لغزة أعاد تواصلهم. هكذا التقى محمد أبو غزال من غزة المحتلة بابنة عمه سميرة أبو غزال من اللد. كلّ وجد نصفه الضائع، تزوّجا عام 1977 وأنجبا خمس بنات وابنا بكراً يُدعى شادي. يعمل الوالد محمد ممرضاً مسؤولاً في مستشفى “النصر” للأطفال في غزة، وكل أخوته وبعض أعمامه وأخواله يقطنون هناك. هو لا يريد أن يترك عمله وأقاربه ويأتي للعيش مع زوجته في اللد داخل إسرائيل (وحتى إن أراد لن يجيز له هذا تعديل قانون المواطنة من سنة 2002). لكن الزوجة سميرة، المواطنة في إسرائيل، لا تريد التنازل عن مواطنتها والافتراق الأبدي عن مدينتها اللد وعن أهلها وأقاربها فيها. هي انتقلت للعيش مع زوجها في غزة لكنها أنجبت أبناءها الستة في إسرائيل. فأكسبتهم بهذا وبحفاظها على مواطنتها المواطنة الكاملة. لكنّ العائلة وأبناءها عاشوا وكبروا في غزة حيث الوالد والوالدة، وهناك أنهى شادي –ابنهما- دراسته الجامعية. نبدأ بمشكلة الأم سميرة. بصفتها تحمل المواطنة الإسرائيلية الكاملة، يحق لها نظرياً أن تدخل إسرائيل متى تريد. وتكمن “المشكلة” في دخولها وبقائها في غزة، إذ عليها أن تحصل كل ستة أشهر على تصريح يجيز لها الدخول إلى غزة والإقامة فيها مع زوجها وأولادها! وكل ستة أشهر، حتى لَو لم تُرِد العودة إلى اللد في إسرائيل، عليها أن تقطع معبر “الحدود” وتجدد التصريح بخصوص الإقامة مع زوجها في بلدته. وللحقيقة رغم غرائبية هذا الأمر ومرارة السفر وقساوة المعاملات عند المعبر، إلا أن إسرائيل لا ترفض منحها التصريح… إذ لا يضير “دولة اليهود” أن ينقص عدد العرب ضمن حدودها وأن يقيموا مع عائلاتهم خارجها. إقامة الأم المواطنة مع زوجها وأبنائها في إسرائيل هو الأمر الممنوع. أخذت المشكلة تتفاقم مع كبر الأبناء، وكلهم يحملون الجنسية الإسرائيلية، بصفتهم مواطنين في إسرائيل مثلهم مثل أمهم. انتقل شادي للعيش في اللد حيث يعمل فيها مدرساً، ولحقت به أختان له. الأخوات الثلاث الأخريات بقين في غزة، اثنتان تزوجتا هناك وفقدتا حق المواطنة الإسرائيلية. قصة هذه العائلة غريبة ونادرة أيضا، إذ أن الزوج من المناطق المحتلة عام 1967 هو الذي يطلب عادة المواطنة حين يتزوج من مواطنة عربية، وتكون النتيجة الرفض وتفسيخ العائلة. محمد أبو غزال لم يطلب هذا، وزوجته سميرة لم ترفض الانتقال للعيش مع زوجها في غزة الى جانب المحافظة على مواطنتها ومواطنة أبنائها. ورغم هذا تقود قوانين إسرائيل وإجراءاتها الى تشريدهم. علماً أن عائلة أبو غزال بسكناها في غزة أسقطت حجج إسرائيل الواهية بأن الهدف من وراء زواج عربي من المناطق المحتلة بعربية من إسرائيل هو المسّ بيهودية الدولة من خلال تغيير ديمغرافيتها، و/أو الانتقال للعيش فيها بهدف القيام “بأعمال تخريبية وإرهابية” في إسرائيل . تشردت عائلة أبو غزال وتقطعت أوصالها من جديد: الأب لا يستطيع حتى لو أراد الانتقال للعيش في اللد مع عائلته، لن تسمح له إسرائيل بهذا الحق. البنات اللاتي بقين وتزوجن هناك في غزة ممنوعات من هذا الحق أيضا. نصف العائلة الآن تحمل جنسية إسرائيلية ونصفها يحمل جنسية فلسطينية “غزاوية”، والنصفان ممنوعان من اللقاء والتواصل والزيارات الدائمة، مع أنهما عائلة واحدة. حال الأم سميرة هي الأسهل نسبياً إذ يجوز لها، كما أسلفنا ، العيش في غزة وزيارة عائلتها الأخرى والعيش في اللد. بانشطار العائلة انشطر قلب الأم الى شطرين، بين الأب وبناتها الثلاث في غزة وبين ثلاثة من أبنائها في اللد. شطر عائلة أبو غزال في غزة لا يستطيع (عدا عن الأم) زيارة نصفه الآخر في اللد. وشطر أبو غزال في اللد “يستطيع”، قانونياً وشكلياً، زيارة نصفه الآخر في غزة، لكن هذا مرتبط بمعاملات خاصة وطويلة ومريرة تنتهي عادة برفض الطلب، إلا في “حالات استثنائية” خاصة ونادرة جداً. سيتوه القارئ كتيه اوديسيوس في “الأوديسا”، إذا ما عرضنا له أدناه كل ما يمّر على الأفراد الثمانية لهذه العائلة المشطورة من مرارات ومعاناة بفعل ذاك التعديل لقانون المواطنة. شطر العائلة الواحدة أصبح، بحكم القانون، وكأنه في “حرب وعداء” مع الشطر الآخر بحكم كونه يقطن “دولة – منطقة- تعرّفها إسرائيل على أنها معادية وفي حرب معها”، وكأنّ لقاء الابن مع أبيه وأخته… يشكل “خطراً إرهابيا” على الدولة. لندع شادي يتكلم: “خلال (11) عاماً مضت لم أستطع تحصيل حق زيارة أهلي في غزة ورؤية والدي إلا مرتين، وكل مرة لثلاث أيام فقط. قدّمت في إحدى المرات أوراقاً طبية تثبت أن والدي مريض بالسكري، قال لي الضابط المسؤول عن التصاريح إن طلبي مرفوض “لأن درجة المرض ليست خطيرة بعد!”. بعد أشهر قدّمتُ له وثائق تثبت أن المرض يتفاقم، أجابني الضابط أن طلبي مرفوض، لأن الوالد ما زال في الخمسينات من عمره ولن يتوفى قريباً بحسب رأيه. سألته محتجاً: “بأي مرض آتيك حتى تسمح لي بزيارة أبي وأمي وأخواتي؟ أجاب: “نوبة قلبية حادة، أو عطل في الدماغ، أو أي مرض آخر يؤكد أن الموت قريب ولا بد منه”. صرخت في وجهه: “سأختصر الطريق وسآتيك ربما بشهادة وفاته”. قهقه الضابط وقال: “سنعطيك فوراً عندها تصريحاً ليومين لحضور الجنازة ومراسيم الدفن”. يؤكد شادي، من تجربته، أن الموت ليس بالضرورة دوماً سبباً وجيهاً وإنسانياً يجيز الزيارة. لقد منعوه من الزيارة للمشاركة حتى في مراسيم دفن جدته، ومن الزيارة لحضور مراسيم دفن ابن عمه. ولشادي ابن يُدعى محمد- على اسم جده، هو في الرابعة من عمره. يتواصل محمد الحفيد مع جده محمد في غزة عن طريق الهاتف. وكان قد زاره قبل سنة ونصف مع والده، لأن الوالد حصل يومها على تصريح بزيارة أمه التي كانت تخضع لعملية جراحية خطيرة في غزة. وهنالك تعرف محمد على ابنة عمته وتدعى لما، كذلك عرف أن جدّه خبير في الدراجات وتصليحها وأنواعها. منذ أشهر يبكي محمد يومياً طالباً أن يلعب مع لما وأن تزوره أو يزورها أو طالباً أن يجلب له جده دراجة للأطفال. يقول شادي: كلما يبكي محمد مطالباً بلما، آخذه في جولة في اللد وألهيه حتى يتعب وأعيده نائماً الى البيت، أما الدراجة التي طالب بها جده، فقمت بشرائها من دكان في اللد وقلتُ له أن جده أرسلها له، ولم يستطع زيارته وجلبها له لأن هذا “ممنوع”. فعلقتُ بأسئلته العديدة عمّا تعني كلمة “ممنوع”، ولماذا جده “ممنوع” من زيارته، بينما أجداد زملائه في الحضانة يزورون أحفادهم. بعد أسابيع من تلك الحادثة تُخبر معلمة الحضانة والد محمد أنه في أثناء تدريسها للأطفال عن العائلة، بالذات عن الجد والجدة فيها، انطلق محمد بثرثرة حماسية وغير مفهومة عن جده وقال إنه في غزة ويرسل له الهدايا، ومؤخراً أرسل له حلويات ودراجة. سألت المعلمة الطفل محمد لماذا يرسل جدك الهدايا لك ولا يجلبها معه حين يزورك؟ ألا يزورك أو تزوره؟ أجاب محمد : “لأ، منّوع”- أي “لا، ممنوع”. نهض شادي من مقعده. أنهى اللقاء من طرف واحد وخرج. بقيتُ وحدي في الغرفة. أخذتُ أفكر كيف سأكتب نهاية هذه القصة. قررّتُ أن أسئلة شادي هي النهاية الأفضل. فهل يقدّم قضاء إسرائيل وضمير العالم الجواب المطلوب لها؟! All this week the Arab Association for Human Rights (HRA) will be publishing the contents of its newest report, “Stripping Citizenship”, in serialized updates here and on our website. These stories were reported and written by Samih Ganadri and edited internally by the HRA. Each story intends to display the human consequences of the discriminatory legislation and to show you reality of an often underrepresented minority. She refused to give me her name, or any personal information about herself, her husband or her family. She fears that the published information would expose her identity, since she is still living in Israel with her husband and her children. I promised her repeatedly that I would change the information that I will publish regarding her identity, without compromising the facts, so that no one would figure out who she was. She said that she believed me, and agreed to meet with me. But, ‘caution is required’. She added that even her friends and her husband’s acquaintances know her by different names and varied information. She does not want to be surprised one day by the security forces surrounding her home, in a town somewhere in the Naqab, to be torn away from her husband and her children, thrown in prison, and deported across the border to Gaza if she is identified. Accused of ‘entering and living illegally in Israel’, despite the fact that her husband is an Arab with Israeli citizenship, and she is a mother to Arab children who also have Israeli citizenship. I jokingly suggested that we name her ‘The dead’. At first, she was afraid, “Dead people don’t speak”. She came around to the joke, though, and said, “I really am dead to life, and so is my family, my husband and children, although we are alive. If the dead heard my story, they would cry in pity and be frightened by this kind of life. They would thank God for his mercy in their death from such a life, a life that requires me to pretend not to exist, to disappear even though I exist, to be dead, although I am alive.” After a sad silence, she said, “Write that my name is ‘the Hidden’ from the ‘dead’ family”. She is from Gaza. She is an educated and intellectual woman, who graduated from high school with honors many years ago in Gaza. She was planning to study law. While she was in Gaza, she met an Arab man from the Naqab area, who was visiting his relatives in Gaza. (At the time, entering and leaving Gaza was permitted). His relatives in Gaza were her family’s, the ‘dead’ family’s, neighbors. They both fell in love. She would wait for weeks and months for him to visit his relatives again. The more he visited, the more they fell in love and their attachment grew. They tied the knot in Gaza shortly after Amendment No. 1 of the Citizenship law was issued. However, their love was much stronger than the limitations and prohibitions of the law. ‘The Hidden’ talked impulsively, nonstop. Like a stream of water, sweeping from a high elevation after a heavy rain that doesn’t stop, a mute who has had her tongue untied. A person who has had a rock shifted from her chest, and the silencer removed from her mouth. Emotions trapped for many years were released, a repressed story that finally found the right to tell itself. During our first meeting, her withered, broken eyes lit up and shone brightly when she started to tell her story. Suddenly, ‘the Hidden’, started to cry bitterly, “Please forgive me, protect my story and my family. I am forbidden to speak, so I can stay here with my family, my husband and my children, so I can maintain my right to be a mother and a wife in my homeland.” I assured her that I would keep her secret. She smiled contently, and as she was saying goodbye, said, “Do not forget that my name is ‘the Hidden’, but my husband’s name is ‘Al Asmar’ (the Dark One), since his skin tone is dark.” Then she suddenly became serious again and said, “What have I done? I have revealed my husband’s color, so she asked me to name him ‘Al Ashqar’ (the Blond), but I told her I will name him ‘Al Asmar’ (the Dark One). Tens of thousands of Naqab residents have dark skin. I hope that the reader will forgive me for not telling all the painful, stressful and horrifying stories of persecution and suffering that ‘the Hidden’ and ‘Al Asmar’ have endured, in order to keep my promise of preserving the family’s identity. Their only fault was that they considered the law of love, and the inclusive human right to have a family, above the racist Israeli law of preventing Arabs, living on both sides of the ‘green line’, from their citizenship and family life simply because they are Arabs. ‘The Hidden’ received a permit to enter Israel from Gaza for two days under the pretext of visiting a relative who was undergoing a serious operation at a hospital in Israel. She then married her fiancé in the Naqab. She and ‘Al Asmar’ have two marriage certificates; one in Gaza, and another in Israel. She lived temporarily in a village in Israel, but the ‘Erez’ checkpoint (a checkpoint between Gaza and Israel) records show that she returned to Gaza. ‘The Hidden’ maintains infrequent contact with her family in Gaza through her husband “Al Asmar” and her children. On rare occasions, ‘Al Asmar’ and his children receive an official permit to visit Gaza to see his wife, although she is living with them here, in Israel. Naturally, she cannot request a permit to visit her parents in Gaza, because according to official records, she lives there. In addition, her parents cannot request permission to visit their daughter here, because, according to the records, she lives with them in Gaza. ‘The Hidden’ doesn’t work or study in Israel, because she doesn’t have an Israeli identity card, and does not officially live here. Her dream of studying law is lost. All she can dream of right now is finding a lawyer who can help her get citizenship, or even residence here so she can openly live with her husband and children, in their own home. ‘The Hidden’ is a prisoner in her own home. She avoids leaving the house as much as possible. Whenever she hears a police siren passing in her area, or sees people she thinks are suspicious near her home; she locks herself in the closet and hides. She also avoids using public transportation. She avoids going out with her husband and children to any nearby Jewish town, whether it is to shop or to celebrate the holidays in an amusement park. All the masks and disguises she might wear, and all the plans she may turn to will not be able to help her if a policeman asks her for her ID. How does she get treatment when she gets sick? There are many humanitarian and Arab doctors in nearby clinics. Sometimes she uses her friends’ health insurance cards, and gets treatment pretending to be someone else. ‘Al Asmar’ has applied for reunification for his wife many times, but the requests have been denied by the Israeli authorities, on the grounds that Israeli law does not permit this. Reuniting a woman with her husband and children, in one home, is not considered a “special humanitarian case” that the authorities should take into account. ‘The Hidden’ exists. The ‘dead’ family is alive. What this mother and wife fears most is that she would really become hidden, when she is discovered and is deprived from living with her husband and children. She also fears that her parents from the ‘dead’ family will die before they see one another again. I don’t know you, ‘Al Asmar’, but I understand you and your concerns. I hope that you forgive me when you read this report, and discover that I did not keep my word and write that you are dead. Your story is alive, you are alive, and you have to stay alive, sitting on Israel’s and the world’s conscience. ‘Al Asmar’, you exist and are alive, your wonderful, heroic wife ‘the Hidden’ is alive. What is dead is the state’s conscience, what is hidden is the law’s justice. A law approved by the court, which calls itself the “Supreme Court of Justice”, requires those who exist to hide, while present. It requires those living to die, while they are alive. هي من عائلة يافاوية أصلية، “جد جد جدي، وعلى مدى أجيال سابقة، وُلد وعاش في يافا. أنا لم أهاجر الى إسرائيل، بل بقيت في وطني حين قامت إسرائيل على أرض هذا الوطن. فأصبحتُ مواطنة إسرائيلية”- هذا ما تقوله نيلي أبو قاعودالمتزوجة من سمير كلاّب العربي الفلسطيني مثلها… “لكنه من مخيم خان يونس في قطاع غزة المحتلة من قبل إسرائيل منذ حزيران 1967” – تضيف نيلي. تعرّفا على بعض وتزوجا في يافا عام 2001 وأنجبا طفلين: لطيفة عام 2002 وعلي عام 2003. يعود أصل عائلة كُلاّب الى يافا أيضاً، لكن العائلة تشردت عام النكبة 1948، واستقرت في غزة. عندما كانت الطرق مفتوحة والتنقل مسموحاً بين يافا وغزة، جاء سمير مع إخوته الكبار للعمل في يافا، كان عمره 12 عاماً. شبّ في يافا، تعرف على نيلي، أحبّا بعض وتزوجا وعاشا معاً في المدينة. في أوائل عام 2004 قامت السلطات الإسرائيلية باعتقال سمير وطرده الى غزة. “أخذوه مني ومن ولديه الطفلين وكبّوه في غزة…” تقول نيلي. هكذا ببساطة… لأنه كان قد صدر يومها “قانون المواطنة والدخول الى إسرائيل- التعديل رقم 1”. “زوجي، أنا المواطنة، لم يَعُد مواطناً، أصبح “متسللاً” ومقيماً غير شرعي في بيته مع عائلته- وأولاده” تقول الزوجة باستغراب! مرّ على هذه الحال ما يقارب ثماني سنوات حتى اليوم (أيار 2012). الأم والأبناء في يافا والأب في غزة. باءت بالفشل كل محاولاتهما لجمع الشمل. إذ أن تفسيخ العائلة وحرمان الزوجة والأطفال من زوجها- والدهم وحرمان الأب من عائلته، ليس “عاملاً إنسانياً” كافياً يوجب إعطاء الزوج حق المواطنة ولا حق الإقامة المؤقتة، أو حتى حق زيارة عائلته لساعات قليلة، ولَوْ مرة واحدة في السنة! إلتقيتُ بأم علي وأولادها في حديقة عامة قرب شاطئ البحر- الشاطئ ذاته حيث تعرفت قبل 12 عاماً على سمير. لاحظت وجود طفلتين صغيرتين إضافيتين معها، عدا عن الطفلين لطيفة وعلي. اسم “الكبرى” رقية وعمرها سنتان، واسم “الصغرى” مينا وعمرها أربعة أشهر. لم أسأل أم علي عن الطفلتين، لكنها لاحظت حرجي من السؤال فبادرتني بالكلام، “جلبتهما من غزة…”. يحق لنيلي أن تزور زوجها في خان يونس، لكن عليها أن تقطع طريقاً طويلاً من الآلام والمماطلة حتى تحصل على التصريح. هي تريد رؤية زوجها وتريد للطيفة وعلي، وقد كبرا، أن يتعرفا أكثر على والدهما وأن يتعرف والدهما عليهما. وأخيراً حصلت على التصريح وعادت من غزة حاملاً برقية. ولأن زوجها مُنع من زيارتها في أسابيع حملها الأخيرة ورؤية ولادة ابنته ، قررت نيلي أن تزور غزة لتُعرّف زوجها على مولودته الجديدة. عادت من هذه الزيارة الثانية حاملاً بمينا. الآن تريد أم علي تقديم طلب بالسماح لها بالسفر مرّة ثالثة الى غزة “أريد أن أريه ابنته مينا، هي صورة مصغّرة عنه” – تقول. أسالها: ألم يقدّم هو طلباً لزيارتكم لرؤية مينا؟ تجيبني أم علي: “بلى، قدّم ورفضت السلطات الإسرائيلية طلبه، هو اليوم مسجون في غزة. الحمد لله، هذا أفضل من أن يقتله الجنود على الحدود”. حين رُفِض طلب سمير بدخول البلاد، قرّر أن يدخلها متسللا عن طريق الحدود المصرية مع إسرائيل. ضبطه الجنود المصريون قبل وصوله الى الحدود الإسرائيلية وأعادوه الى غزة. اعتقلته السلطة في غزة وسجنته، إذ اشتبهت فيه أنه، إما مهرّباً للمحظورات وإما عميلاً لإسرائيل. تعيش نيلي وأبناؤها الأربعة في “شقة” من غرفتين صغيرتين وزاوية أصغر للمطبخ. هذه ليست شقة عملياً، وإنما عيادة سابقة لطبيب أسنان استأجرتها وجعلت منها شقة للسكن. بسبب إعاقتها المرضية هي لا تعمل، وتعتاش بفقر على مخصصات “التأمين الوطني” التي تصرف غالبيتها على أجرة “الشقة” وفاتورة الكهرباء والمياه والغاز، ويتبقى القليل للطعام وللثياب ولتنشئة وتعليم أربعة أولاد. هي لا ترسل ابنتها الثالثة- رقية- إلى الحضانة، لعدم تمكنها من دفع الأقساط الشهرية، والجيران أعطوها عربة أطفال مستعملة لابنتها الرابعة- مينا- للجلوس وللتنقل… وللنوم فيها. الأنفار الخمسة ينامون في غرفة واحدة صغيرة. o نعم، أتحدث معه يومياً في الصباح والمساء. o أسأله عن حاله وأحدثه عن دروسي وعن أخوتي وعن الماما، وأطلب منه أشياء أريد أن يجلبها لي عندما يعود للعيش معنا. o لا. أنا أتحدث معه عن طريق “الجرّار”، لكن أكيد البابا يسمعني. صُعقْت، سألتُ والدته عندما عدنا ما هو “الجرار” الذي يقول علي إنه يتحدث بواسطته مع أبيه؟ صُعقت هي الأخرى. فسّرت لي أن “الجرار” باللهجة اليافوية هو “الجرور”. توجد في غرفة نومهم مرآة في أسفلها جارور، وداخل الجارور توجد صورة لأبي علي. “الآن فهمت لماذا غالباً ما أجد الجارور مفتوحاً حين أدخل غرفة النوم”- قالت أم علي. ودّعتُ نيلي، ليس قبل أن أقول لها: “من يجعل من أب الأطفال صورة في جرّار، يضع قيم الديمقراطية والعدالة على كفي عفريت، ويضع مستقبل شعبه ودولته “اليهودية” في زنزانة”. قبل أن أبتعد سمعتها تنادي: “يا أستاذ، يا أستاذ، نسيت أن أقول لك إن جارتنا كاتيا يهودية قدمت الى البلاد من روسيا قبل 12 عاماً، وحصلت على المواطنة في المطار حال وصولها. قبل تسع سنوات سافرت للسياحة في أمريكا، تعرفت هناك على مايكل الأمريكي، هو ليس يهودياً، تزوجا وعادا الى البلاد. أصبح مايكل أيضا مواطناً”. The comments on this blog, content of blogs in our blog roll, content of sites linked to on our blog, and posts by guest authors on this blog are the opinions of their authors and do not necessarily reflect the views of the Arab HRA. Comment publishing is at the discretion of the site moderator. Any comments that are racist, sexist, homophobic, or denigrating of any individual's faith background, including but not limited to anti-Semitic or Islamophobic comments, will not be tolerated.